Before mail reaches recruits, Marine postal clerks work tirelessly Monday through Saturday to get it sorted and ensure it is delivered to recruits in training the same day. To ensure recruit mail arrives in a timely manner, Marine postal clerks stress the importance proper packaging and providing an address that includes the recruit's full name, his or her full unit name, a post office box, and a return address. —USMC photos by Corporal David Bessey, 2014. From Sandboxx as a text message. You can read more about Sandboxx by clicking here. When you get your recruit's platoon number and address from one of these three sources, you can start sending letters. It is always possible that a platoon number or address may change. Accept that as a possibility and start writing to your recruit. Though your recruit may move from one location to another during boot camp, you will always use the same mailing address for him or her (see the text box below for exceptions). The first letter you receive from your recruit will be a form letter. This letter should arrive in your mail box in approximately 10-14 days after they leave. The form letter should include your recruit's mailing address. 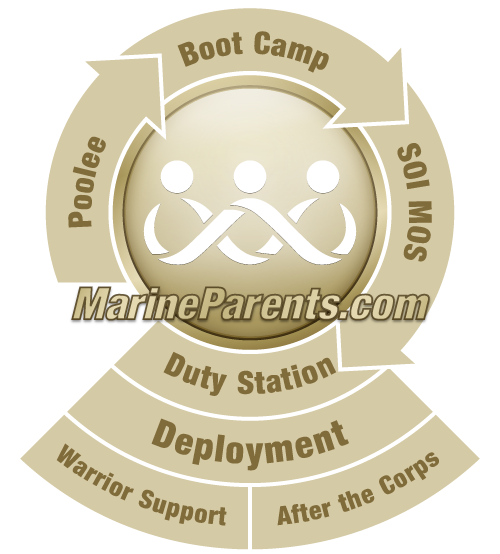 Click here to see a sample boot camp address from an official USMC website. The published addresses are subject to change and are intended as a guide only. Please use the address that your recruit sends you. If you do not get the form letter in 10-14 days of your recruit's departure, contact his or her recruiter. The recruiter should be able to provide you with your recruit's mailing address and platoon number. If you have to contact the recruiter, ask him or her to pull up your recruit on the Marine Online Locator (MOL). NOTE: Recruits can ask that mailing addresses not be given out, including to family members. Though this is rare, the recruiter, must honor this request. Please, resist sending anything but letters. While you may be tempted to send additional items, your Recruit will thank you for not sending anything else. Unless you are specifically asked to send something to your recruit, don't do it. Address your letters to "Rct. Last name, First name." Your son or daughter is NOT a Marine yet. DO NOT put any other rank other than Rct.—which means "Recruit"—and refer to him or her as such when addressing the envelope. Doing otherwise will cause unnecessary attention at mail call and you don't want to do that. Do NOT put your recruit's social security number on the envelope. Mail arrives at the Recruit Depot Monday through Saturday. Depending on the training schedule, there may be a few days delay getting the mail into you recruit's hand, with the posssibly of further delays in your recruit having an opportunity to open and read his or her mail. Don't despair, as training comes first. Your recruit's mail will never be held for disciplinary reasons. Your Recruit may be homesick. Very, very homesick. Write lots of letters and then write some more. Keep them upbeat. Send a small photo or two. DO NOT decorate the outside of the envelope with drawings, stickers, or write any text other than the address and your return address (and no spritz of perfume either). This will cause unnecessary attention from the Drill Instructor during mail call. Though your recruit may move from one location to another during boot camp, you will always use the same mailing address for him or her. The first exception to this rule would be if your recruit is assigned to the Physical Conditioning Platoon (PCP), his or her address will be the PCP until assigned to a regular platoon. The second exception to this rule would be if your recruit is sent to the Medical Rehabilitation Platoon (MRP) for an extended period. MRP is for recruits who become wounded, ill, or injured. Getting ready to write your recruit? See what "Gunny Says..." about letters to recruits below. He has critical tidbits to share and you'll be glad you had the opportunity to absorb his input before you pick up a pen. We have been a nation at war for almost eight years; most of your sons and daughters were in elementary school during the September 11th attacks. With that being said, I commend you as parents for supporting your son's (or daughter's) decision to become a United States Marine. Do NOT emphasize that "you always have a home to come back to" or "we'll still love you even if you don't make it" because failure is NOT an option. Am I saying to kick them out of house and home if they don't succeed? No. I'm saying redirection is a better support tool than empathy. Make no mistake about it; your sons and daughters are the future of this nation. Treat every letter you write like communist propaganda. Think very carefully what you WANT to convey, then proof read to make sure it's the message you ARE conveying.